The grid rolls off on its green flag lap. The only car not in sight is Alan House's Morgan +4 tucked away to the left by the pit wall. As usual a beautiful grid of cars but we could have done with a few more. Along with VSCC Spring Start and the Castle Combe Autumn Classic, The Bentley Drivers Club meeting at Silverstone, is one leg of a tripod of key events on which FISCAR bases its season, notwithstanding any other events arranged between those dates. Although our grid here was just about adequate (24 entries, 23 qualifiers, 21 starters) it was a disappointing number and down on last year's entry. A decent grid for this unique meeting should surely have been in excess of 30, so in reality we were around 10 cars light of where we should have been. The BDC appear to like us and our cars, so there is every reason to expect that we will be invited back next year, so hopefully we will do better, particularly since the meeting provides opportunities for a second race. The withdrawal of the Brian Arculus Alfa Romeo Giulietta SVZ through mechanical woes meant that 23 cars took to the track for qualifying. It was not altogether a surprise that Jonathan Abecassis and Richard Woolmer put Jonathan's Austin Healey 100/4 on pole, but running them close was Stephen Bond in the splendid Lister Bristol Flatiron, less than a couple of tenths behind with new to FISCAR, Paul Kennelly qualifying his Austin Healey 100M an excellent 3rd. David Cottingham tells me that it was his co driver, Adrian King who qualified David's AC Ace in 4th, this pairing beginning to form quite a potent force on our grids. Last year's winner, Robin Ellis, was 5th in Tony Mantle's Lotus Elite, Robin's own Elite currently hors de combat and Jim Campbell placed his Austin Healey 100/4 alongside on the third row. 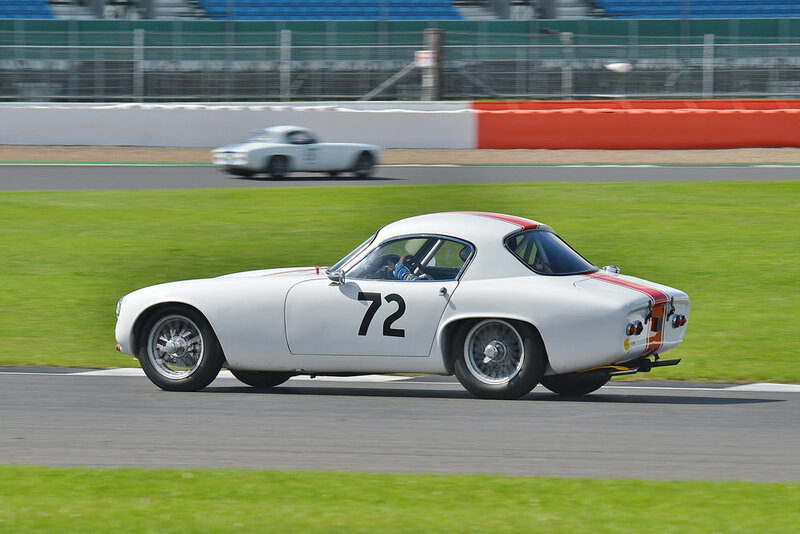 Row 4 consisted of Nigel Winchester's special bodied AC Ace and Paul Mortimer's Austin Healey 100. Just 2.1 seconds separated the top 8 qualifiers but there was a substantial gap of 1.25 seconds to the following group, ninth qualifier being Alex Quattlebaum in the Leco Sport. However, Alex tends to be quicker in the race, and alongside him was the equally enthusiastic racer, Paul Ziller, in the TR2 closely followed by Peter Campbell in the Wingfield Bristol. Barry Dye completed row 6 in his Lotus Elite and row 7 was made up of Matthew Holme in the fabulous Alfa Romeo 1900CSS Touring returning to us after a long absence, and Andrew Mitchell and Mark Morgan in Mark's AC Ace. Keith Hampson was next up in the delightful Sunbeam Alpine Le Mans, a little happier with his qualifying position compared to Spring Start, with Nick Atkins sharing row 8 in his Lotus Elite. Less than a tenth of a second behind was John Waterson in his Elite, which promised some close racing between the pair of Loti. John shared row 9 with the Lancia Aurelia GT of Jason and Louise Kennedy although this Italian exotic thoroughbred qualified 1.7 seconds behind the Lotus and was another that I thought might find a bit of extra pace in the race. Row 10 featured Alan House in the Morgan +4, both Alan and car being first time out with us and very welcome, and he shared that row with Roger Daniell in the ex works MGA Twin Cam, probably, along with Mark Campbell's ex Le Mans Aston DB 2, one of the two most original specced cars on the grid. Mark qualified the Aston behind the MGA and only two other cars were classified behind them - Chris Mann's Alfa Romeo Disco Volante with a slow time, and Mark Hoble, his TR2 failing to record any time due to an engine cut out problem under load, thought to be a fuel demand problem. Chris Mann failed to get to the grid, the magneto problem unresolved, although he has since reported back that he was able to drive the Alfa home whereupon the problem was quickly cured! Mark Hoble brought the TR2 onto the grid after Jason Kennedy had checked over the fuel system for him, but the engine cut out under load and failed to get off the line. Since they felt that they had exhausted fuel issue options, thoughts turned back to the electrics being the culprit. Thus 21 cars lined up and 20 got away. Stephen Bond made a great start to head the pack into Copse for the first time. He was chased by Paul Kennelly in the Austin Healey 100M, whilst Jonathan Abecassis made, by his own admission, another tardy start and settled into 3rd place. Paul Ziller made a good start getting his TR2 ahead of both Paul Mortimer in the Austin Healey (145) and Alex Quattlebaum in the LECo (11), although the Austin Healey's ultimate pace was 1.5 seconds a lap quicker than the TR which was to have its own drama, here, in Luffield a few laps later. As the cars crossed the line to complete lap 1, it was superb to see the truly historic Lister Bristol heading the field, Stephen going great guns, closely shadowed by Paul Kennelly in the Austin Healey 100M. The pair had already opened up a gap of 1.5 seconds over Jonathan's 100/4 who had the close attention of Robin Ellis in the Lotus Elite. These two in turn had eased away from the chasing group led by Jim Campbell's 100/4, Austin Healeys therefore occupying 3 of the first 5 places. Jim was followed over the line by a quartet of cars separated by just 1.5 seconds - Nigel Winchester (AC Ace), Paul Ziller (TR2), David Cottingham (AC Ace), and Paul Mortimer (Austin Healey 100). Classic British sports cars all. Rounding out the top 10, just a few tenths behind was Peter Campbell in his unique Wingfield Bristol Special. In 11th place just half a second down on the Wingfield was the little LECo2 of Alex Quattlebaum but a gap of 3 seconds separated them from Matthew Holme in the lovely Alfa with other gaps also already opening up behind. Mark Campbell, race rusty after a long absence was trying to re acclimatise and was playing tailgunner in the wonderful old DB2, the exhaust note of which, as he exited Woodcote, was so nostalgically a sound of those early 50s, and recalled by all the old footage from that era. The second lap saw some changes but at the front, Stephen Bond had opened a small gap to Paul Kennelly, and both, surprisingly, were pulling clear of Jonathan Abecassis, the gap out to 4 seconds at the end of the lap. However, part of the explanation was that Jonathan's Austin Healey had been overtaken by the Elite of Robin Ellis who was running without effective rear brakes and consequently sailed straight up the slip road at Maggotts, losing about 18 seconds and falling back to 16th. Clearly this distraction unsettled Jonathan, yet to get into his racing rhythm, and it took him a couple of laps to get up to full speed! Robin's brief departutre from the track elevated Jim Campbell's Austin Healey 100/4 to 4th. Paul Ziller had brought the TR2 up into 5th by the end of the lap and he was really pushing on having passed Nigel Winchester in the special bodied AC Ace. Nigel had had a slow lap and was passed by Paul Mortimer, David Cottingham and Alex Q. Nick Atkins had made a couple of places in his Lotus Elite but otherwise the status quo had been maintained at the back of the pack. Jim Campbell heads through Luffield as Paul Ziller and Paul Mortimer exit Brooklands. They were lying 4th, 5th & 6th at the time. Into lap 3 and the gap between the leaders had grown to 1.5 seconds whilst Jonathan Abecassis had dropped further back in 3rd. It was not until lap 4 that he started to stabilise the gap to Stephen Bond in the lead, to just under 9 seconds. We had lost Paul Kennelly's Austin Healey after only completing 4 laps (reason unknown at time of writing), so Jonathan was elevated to 2nd but that was a lot of time to make up on the leader. Paul Ziller had the TR2 up to 4th by this time, the meat in an Austin Healey sandwich since he was being pressed by Paul Mortimer and unable to get to Jim Campbell just ahead. In fact Jim had the TR covered and was gradually easing away to consolidate his 3rd position. Meanwhile, Alex Quattlebaum had moved the LECo up to 8th having overtaken David Cottingham in the AC, who had also been repassed by a recovering Nigel Winchester in his Ace. Robin Ellis was also rapidly recovering ground in the Elite having risen to 12th on lap 3, 11th on lap 4 and 10th on lap 5. With plenty of the race left to run he had time to make further inroads into the frontrunners. However, as we shall see shortly, another event intervened to further delay his progress. The battle towards the back between the Nick Atkins (Elite) , Mark Morgan (AC Ace) and John Waterson (Elite) continued to rage until Nick pitted on lap 8. First to pit was Keith Hampson in the Sunbeam Alpine Le Mans, on lap 6. At the end of Lap 7, Stephen Bond was still holding a comfortable lead of around 9 seconds and as they started to lap the field, Jonathan Abecassis was unable to make any real impact on this lead although he was very firmly in 2nd place, around 11 seconds ahead of Jim Campbell. Jim had a small cushion to Paul Ziller's TR2 but Paul Mortimer's Austin Healey was still firmly glued to the tail of the Triumph. 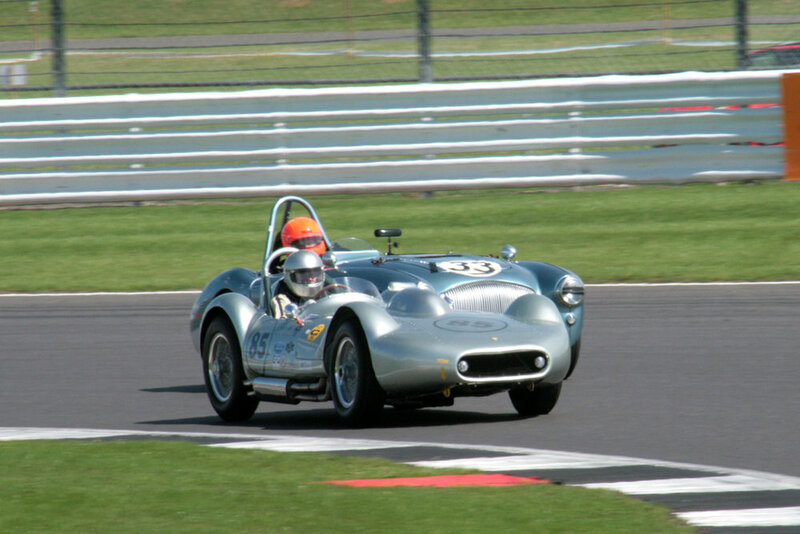 The next car up was Peter Campbell's Wingfield Special in 6th followed by David Cottingham's AC Ace. Alex Quattlebaum (LECo2), Robin Ellis (Elite) and Nigel Winchester (AC Ace) in 8th, 9th & 10th respectively and separated by 5 seconds all pitted on that lap. Paul Mortimer with, ultimately, a slight pace advantage hassled Paul Ziller for many laps but was unable to get by. At the end of lap 8, the leader pitted and 26 seconds later, Paul Mortimer, still in 5th place and still unable to get by the well driven TR2 of Paul Ziller decided to take his pit stop in the Austin Healey. It was a timely decision for had he stayed out he would almost certainly been involved in the dramatic event that took place in Luffield on the following lap. As Ziller headed into Luffield for the ninth time, there was an almighty crack and the TR launched into a high energy roll, becoming briefly airborne causing the rapidly closing Robin Ellis in the Elite to take avoiding action. The TR had broken the studs on the nearside rear hub and the car just catapulted into the air. It came down on its roof and slid at some pace into the gravel which eventually brought it to a halt. It was with some relief that Paul was seen emerging unaided from the car but clearly shaken. An effort to piece it together visually is shown below and I should add that it would not be illustrated had Paul not emerged unscathed. Apologies for the quality which is down to the writer! Robin Ellis had the in car camera running and this is a still captured from that footage. Low resolution but gives some indication of the sudden violence of the launch. Paul was taken to the medical centre but soon pronounced fit. In the meantime, Jonathan Abecassis who had assumed the lead once Stephen Bond had brought the Lister Bristol into the pits was putting some fast consistent laps in and they were generally that bit quicker than the Lister after the latter had rejoined the race, so that when Jonathan who had stayed out until lap 15, pitted, the gap on the road to Stephen should have been reduced when Richard Woolmer took over the Austin Healey. The dramatic departure of Paul's TR2 elevated most of the field so that whilst Jonathan led Jim Campbell by just of 18 seconds at the end of lap 9, Peter Campbell, in a strong drive had the Wingfield up to 3rd and Matthew Holme in the Alfa was up to 4th, the top six rounded out by the Mitchell/Morgan AC and the Kennedys Lancia. It was, of course, a temporary situation as none of them had yet pitted, but it was good to see them all well up the field at this stage. Silver Speed! Fabulous Mick Walker shot of Stephen Bond in his Lister Flatiron Bristol, and the similarly powered Wingfield Special with Peter Campbell on board. Although Stephen has just lapped Peter, the latter appears to be having a gentle lock up to ensure avoidance of the tail of the Lister. Robin Ellis, in taking avoiding action, around Paul Ziller's TR2 had again lost time but not places, and by the end of lap 9 was up to 7th and embarking on another recovery drive. On the same lap the Lancia Aurelia retired, making four retirements and the last to do so. Only 4 cars hadn't taken their pit stops by the end of lap 10 and the very last to do so was the leader, Jonathan Abecassis, who brought his Austin Healey in to hand over to Richard Woolmer on lap 15 and it was going to be interesting to see where the car emerged in relation to erstwhile leader Stephen Bond in the Lister Bristol. The lap times between the two were pretty close but Jonathan had perhaps managed to gain a little and also clearly attacked the pitlane entrance prior to the compulsory speed limit quicker than Stephen and this had proved decisive. At the end of lap 16, the lap charts show the Austin Healey to have an 8 second lead over the Lister Bristol which had gone out to 8.4 seconds the following lap, but Stephen wasn't done yet! Jim Campbell. circulating strongly in 3rd place, was nearly 12 seconds ahead of Robin Ellis who had finally moved through to 4th and was closing on Jim at about 2 seconds a lap. 5th was Paul Mortimer in his Austin Healey just a couple of seconds ahead of the Cottingham/King Ace Ace who was less than two seconds ahead of the LECo of Alex Quattlebaum. In 8th place, and the last still on the lead lap was Nigel Winchester in his AC Ace. 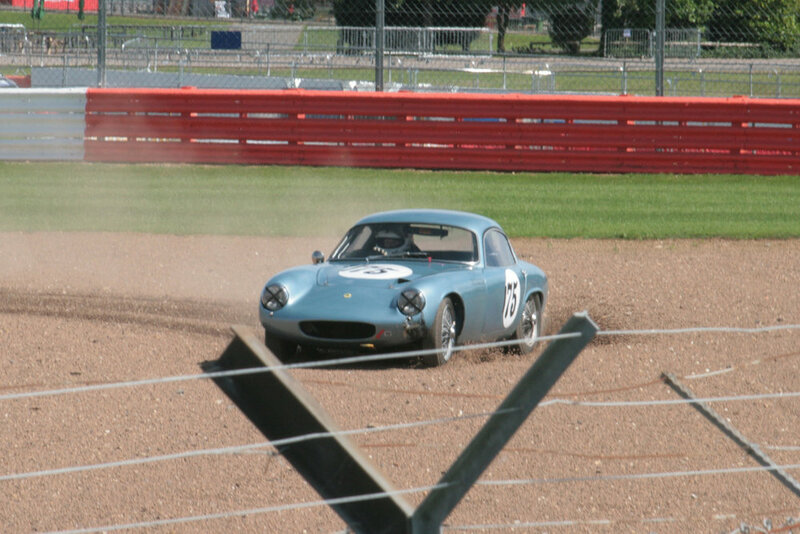 As the race entered its final stages there were still a couple of unresolved battles not least of which was that for the lead, as Stephen Bond launched an all out attack on the leader with a string of consistent laps below 1.14 which brought him ever closer to Richard Woolmer in Jonathan's Healey 100/4. That 8.4 second gap was reduced by almost 2 seconds a lap initially although Richard sensing this late charge upped his lap times slightly but after putting in a superb FL at 1.12.911 on lap 22, Stephen arrived on Richard's tail on lap 23 and harried him, finishing just under 4 tenths behind at the chequered flag after 24 laps. 48 seconds behind finished Robin Ellis having overcome two incidents and ineffective rear brakes to get there. On the road, Jim Campbell finished a fine 4th but was penalised 5 places for infringing our pit stop regulations, which promoted Paul Mortimer in his Healey 100, to 4th, but Paul had been closely challenged by Adrian King in David Cottingham's AC Ace Bristol and just 4 tenths separated them at the flag.